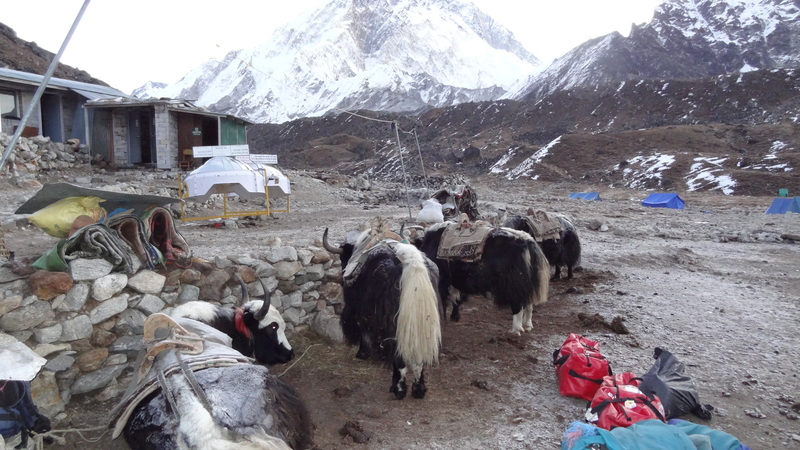 I had the worst night’s sleep of the trek yet in Lobuche at 4,950m. 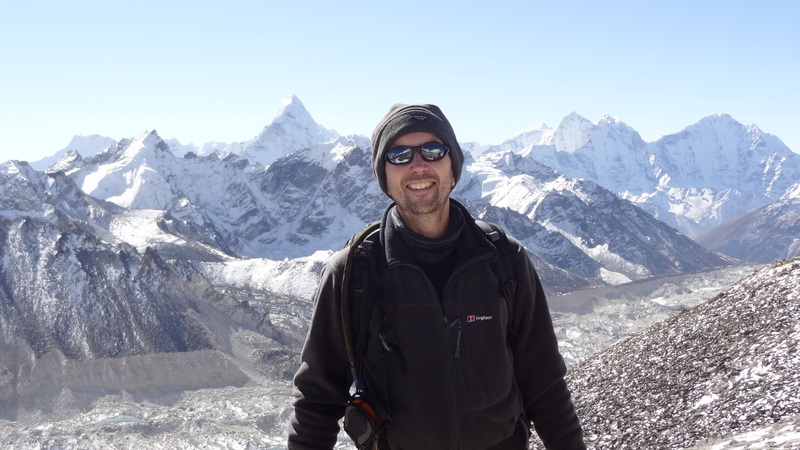 Perhaps it was the anticipation of getting up at 5am to get to Everest Base Camp that had something to do with it. It was more probably to do with a banging head and an inability to get my breath though. There was one (thankfully brief) moment when I just about couldn’t get my breath at all, and I thought that my whole trip was over there and then. Somehow I managed to get myself calmed down again, and tossed and turned the rest of the night until the 5am wake up call came. 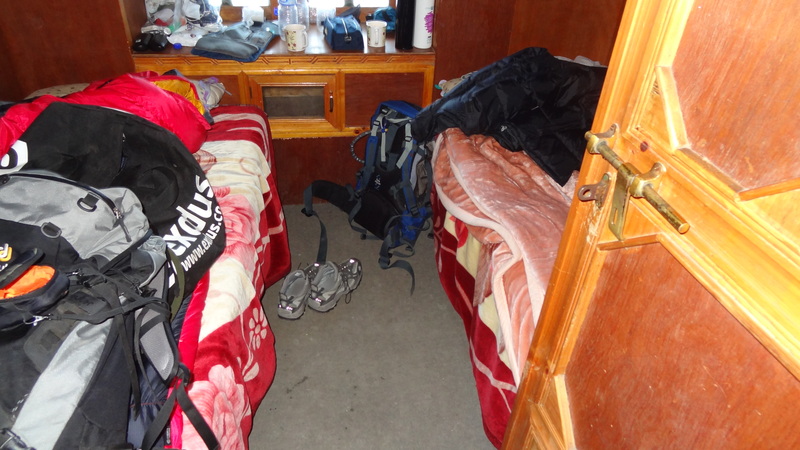 The temperature in our room was -3C, and the outside temperature -9C as we set off after a hurried bowl of porridge. 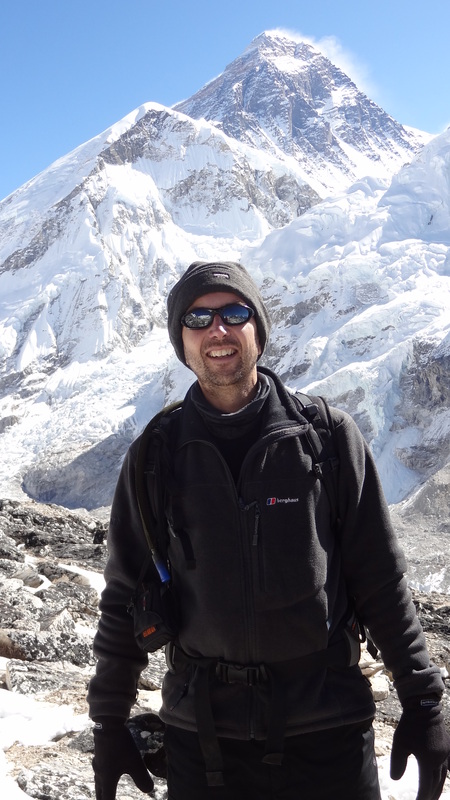 I was wrapped up in practically everything I had, bar my down jacket, as I figure that if I make to Island Peak I’d like to appreciate its benefits as much as possible. Daylight was just breaking, although the sun would be another hour before it made an appearance. I felt like a bit of a zombie for the first hour or so, but nothing was going to stop me getting to EBC. Even the yaks have ice on their backs this morning! 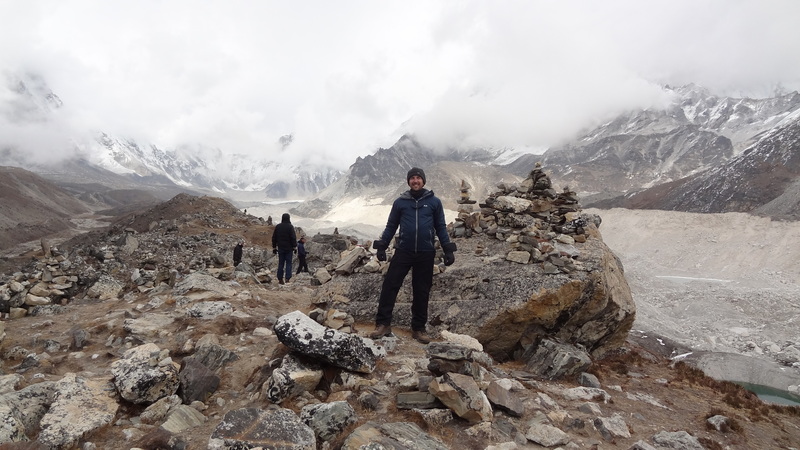 We walked along the edge of the same glacial moraine from the Khumbu glacier that we had finished off seeing yesterday afternoon. It is truly spectacular, although it was literally so cold that even with my ski gloves on it was too cold to grab the camera out for a while. The views ahead though, continued, as they have every day, to get better and better, and the crisp dawn air makes the mountains even more intimidating and monstrous than ever before. 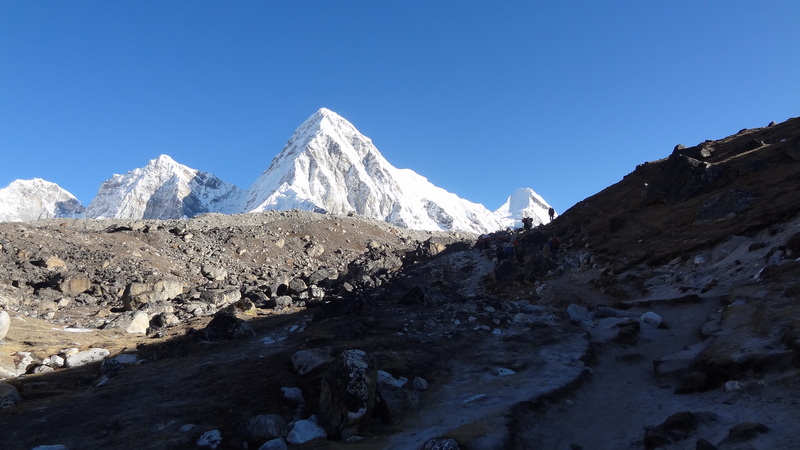 We had the gargantuan west wall of Nuptse on our right, and the eastern approach of Pumori on our left. It is truly staggering to think that in the photograph above, we are are walking at an altitude of above 5km, and yet there are peaks towering two and three kilometres above our heads still. 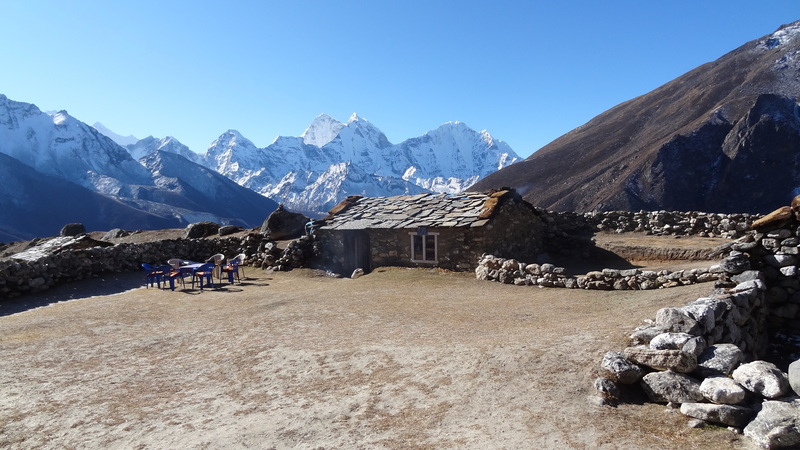 This really takes some getting your head around, and is true mark of the majesty of the upper Khumbu valley. One of many memorials en route which mark the deaths of those who have died up here. As the sun starts to rise from behind Nuptse, it shines upon the great peak of Pumori, at 7,165m staright ahead of us, and the path we are on now gets significantly more rocky and harder to walk upon. 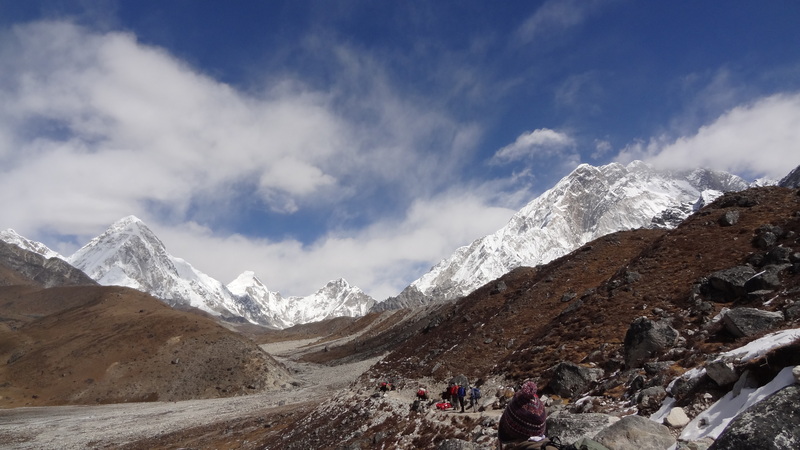 Pumori dominating our path ahead - another spectacular sky too. 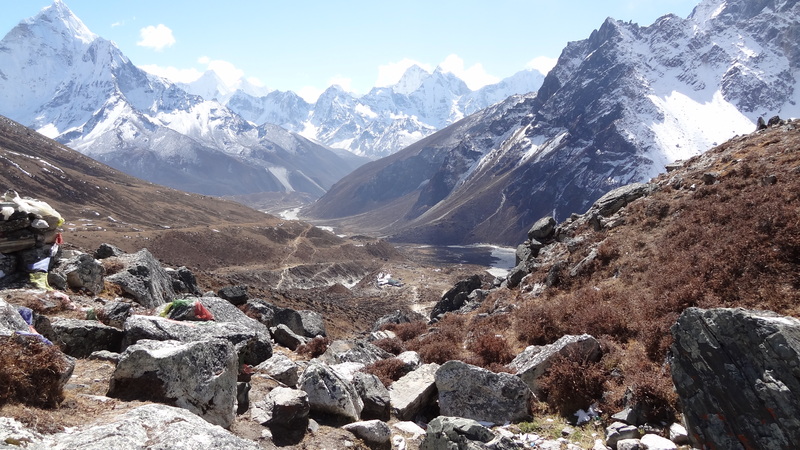 The upper Khumbu Valley - Lingtren, Changtse, Nuptse. Colossal. 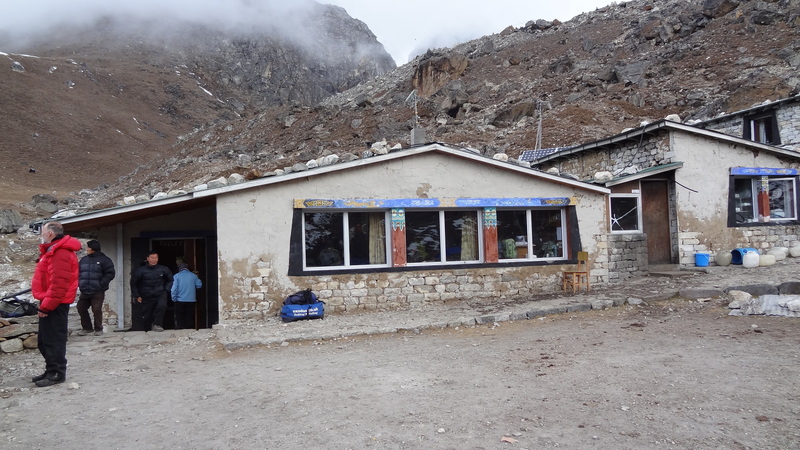 After about two and half hours we came to the highest settlement in the world (true that), called Gorak Shep, at 5,180m (17,000ft). 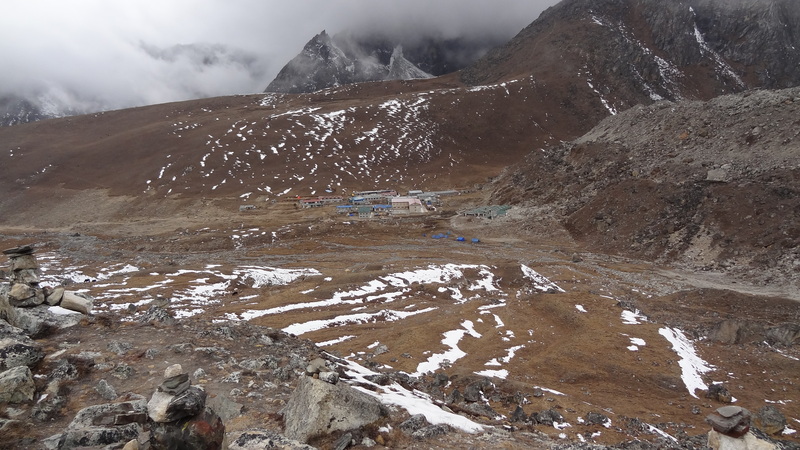 It is not a true settlement probably, as it consists of just a few lodges for trekkers, but it must set a lot of records. 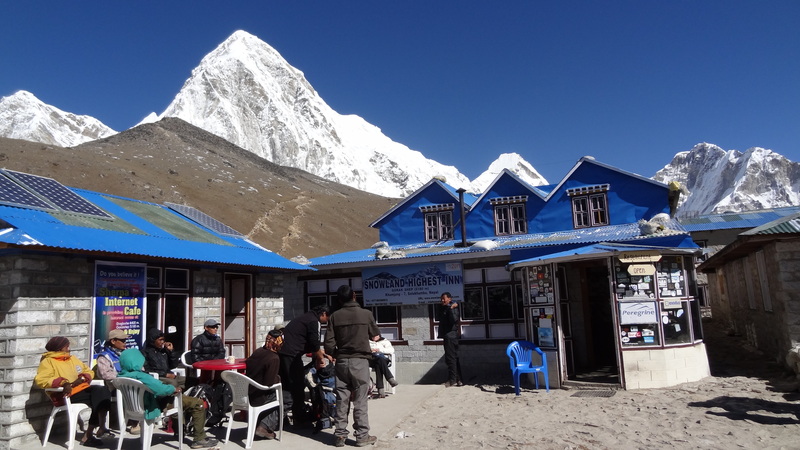 We had our second breakfast of the day before setting out at about 10am for the highlight of the trip so far, Everest Base Camp. I actually don’t mind admitting that everything became rather overwhelming for me at this point, and I shed a tear. I was stood outside, and the enormity of everything that I was doing just hit me. Ngima came over to me and asked if I was OK, and I just told him that I was incredibly happy, which was a huge understatement. 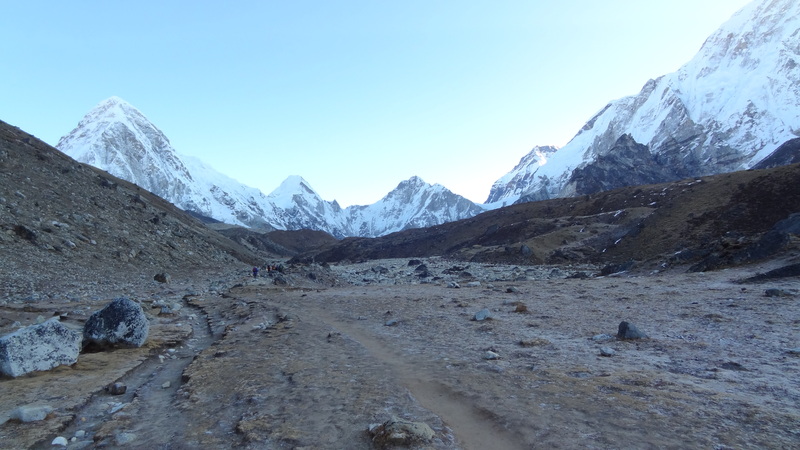 Gorak Shep is finally in sight, the Khumbu Icefall in view in the distance too! The weather by this time was gloriously sunny, and we set out to ascend the remaining 200m or so in height, and three or so miles, which would take us another two and a half hours. 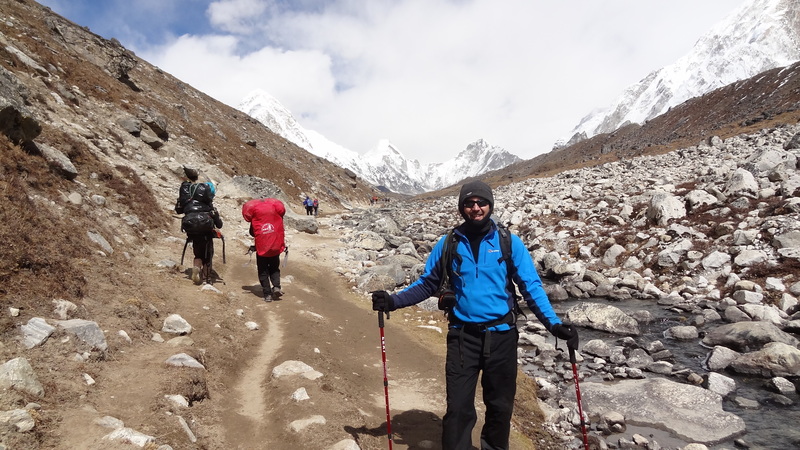 The walk is mainly along a ridge, with the Khumbu glacier on one side, and Pumori on the other. 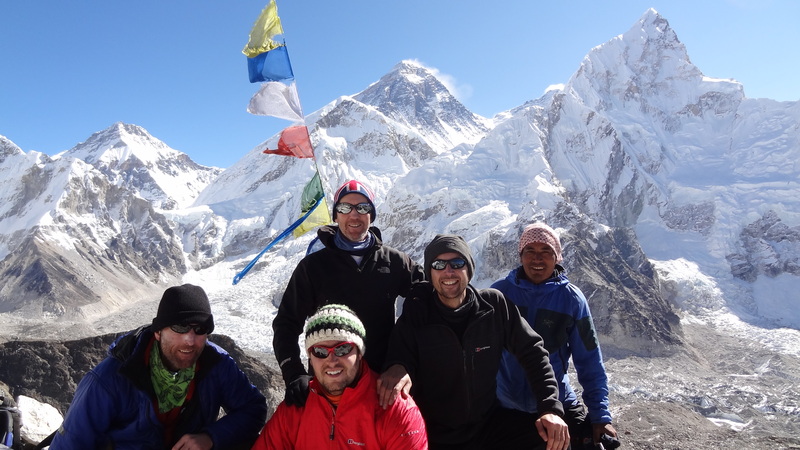 We were able to clearly see some climbers on Pumori making their way to the final summit ridge at about 7,000m. Rather them than me is all I can say, it is one steep and brutal mountain, but breathtaking too. Stopping often, as I was determined to do, not just to breathe, but to take it all in, was just fantastic. I can’t use words to adequately explain any of this at this point. 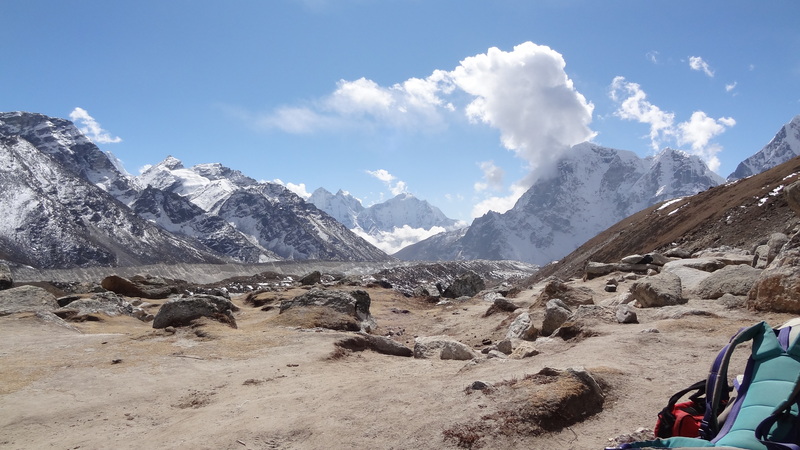 Here is a picture taken back down the valley now, which shows you just the sort of landscape we are in – this is the Khumbu glacier, the highest glacier in the world, cutting its way through 7,000m peaks like they weren’t there. It is ridiculous, mesmerising stuff. The sign points the way! The magnificent west wall of Nuptse dominates the skyline. 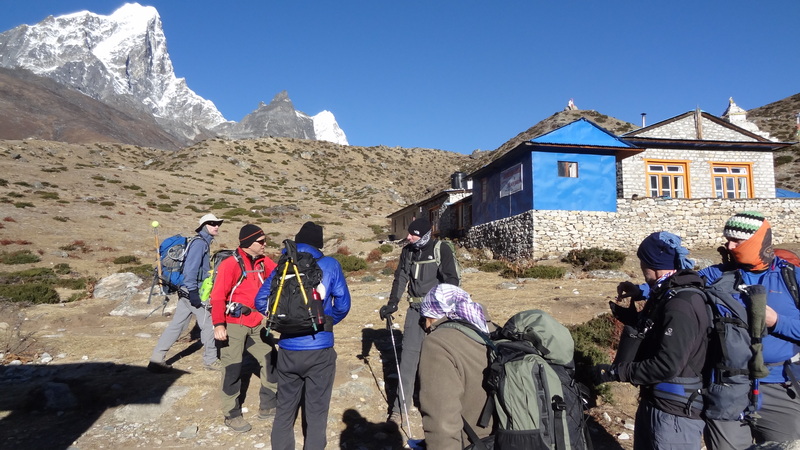 After a very undulating walk, Base Camp came into view! 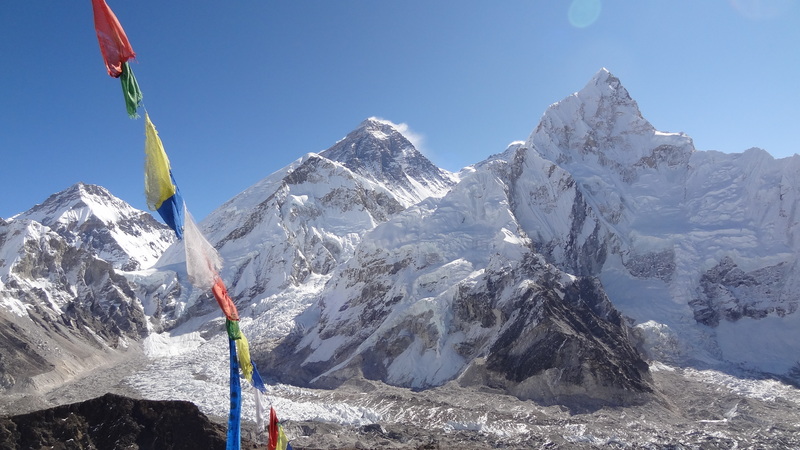 We could also briefly see the summit of Everest herself poking above Nuptse. 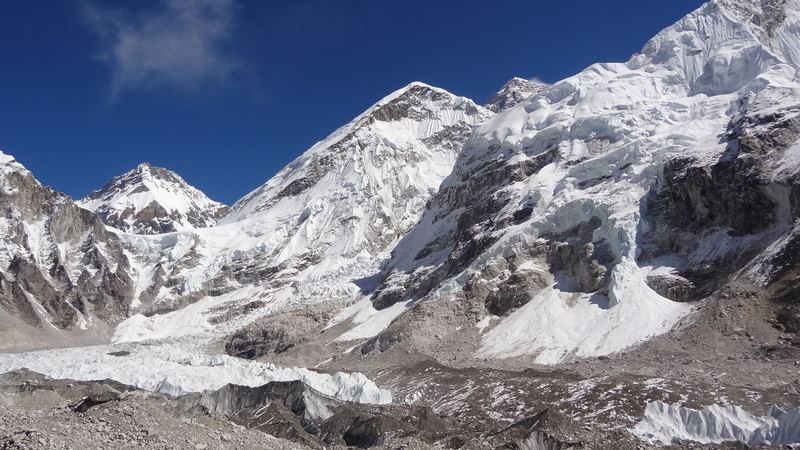 A teasing view of Everest's summit over the shoulder of Nuptse, the Khumbu Icefall on the left. I just thought I would point out something in the above picture too, to put things into perspective here. The mountain on the left, the one under the wispy cloud, doesn’t look that big from here does it? Well it is Changtse in Tibet, and it is 7,583m, or a shade under 25,000 feet high. 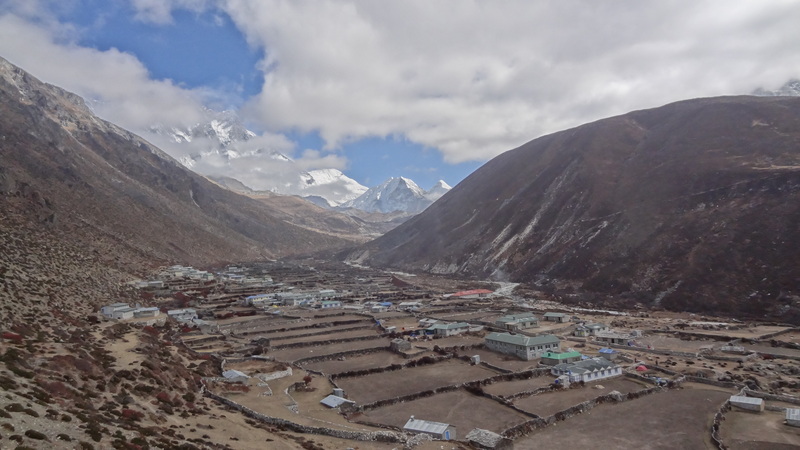 That might give you a clue as to what looking at the walls of Nuptse, Lhotse and Everest are like, and just how stonkingly monumental they are, even when viewed as here from 17,500 feet up. Nothing can possibly tell you what it is like to be in this picture unless you have been fortunate to stand here. I am so incredibly lucky, I really am. 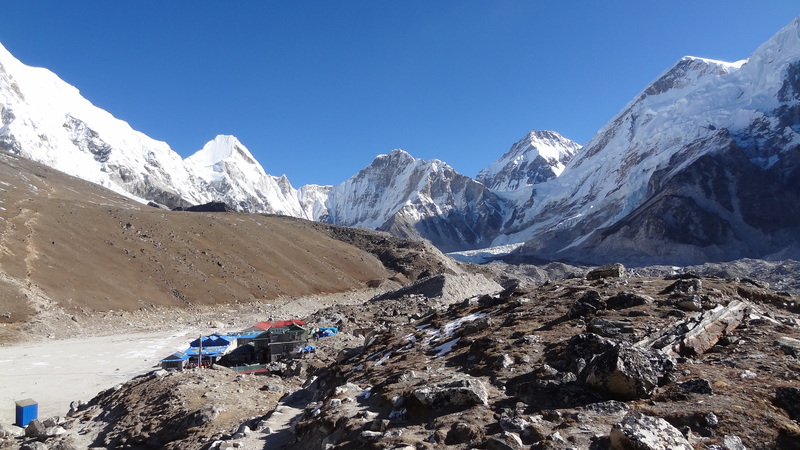 At the far end of Base Camp, away from where the ‘public’ access is, were a number of yellow expedition tents – people choosing to climb either Lhotse or Nuptse probably, as they share the same Base Camp. Everest herself is almost always only ever climbed when a small weather window opens in late April/early May. We were now very close, and the excitement soared. 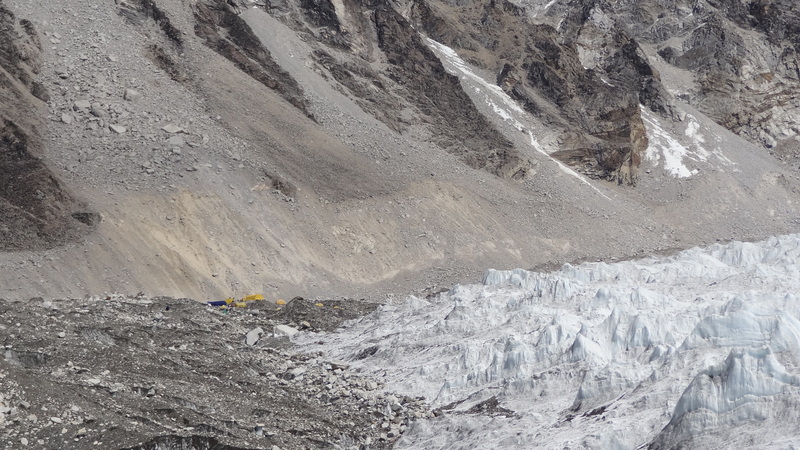 Expedition tents visible at the far end of EBC - away from the 'public' area. The view, albeit brief, of Everest today was a huge bonus too. 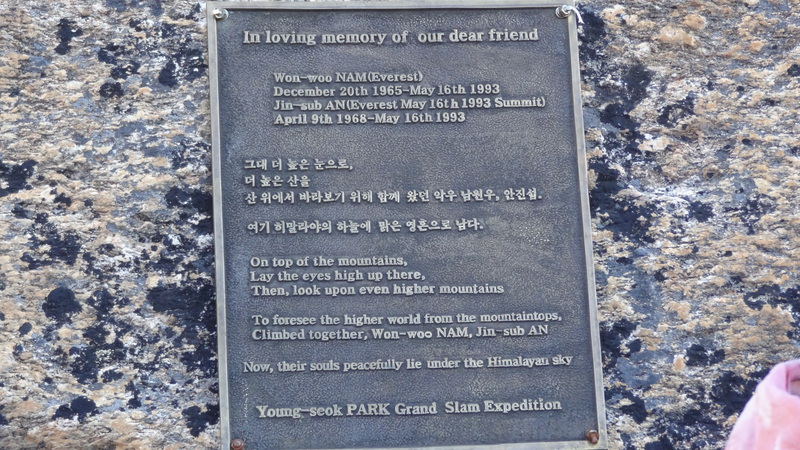 I hadn’t expected to see it at all today, as I know that you cannot see it from Base Camp. The weather again helped – we have been so lucky, and the sun again shone on us incessantly. Pure magic! 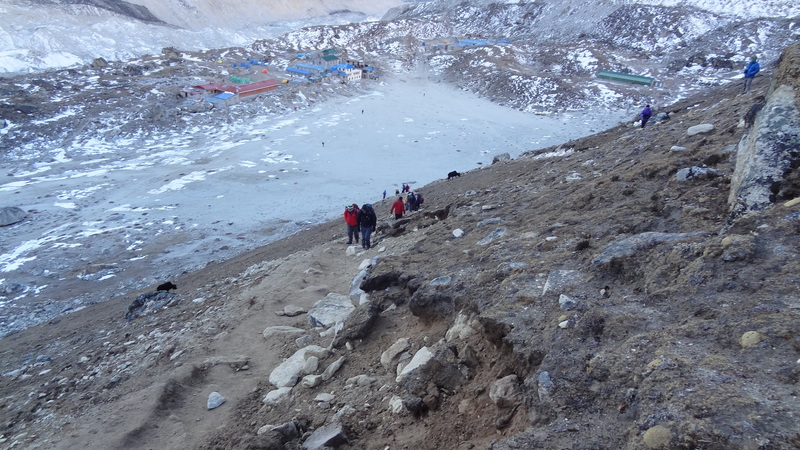 The walk now to Base Camp itself is now a bit of a scramble over boulders and onto the glacier itself. 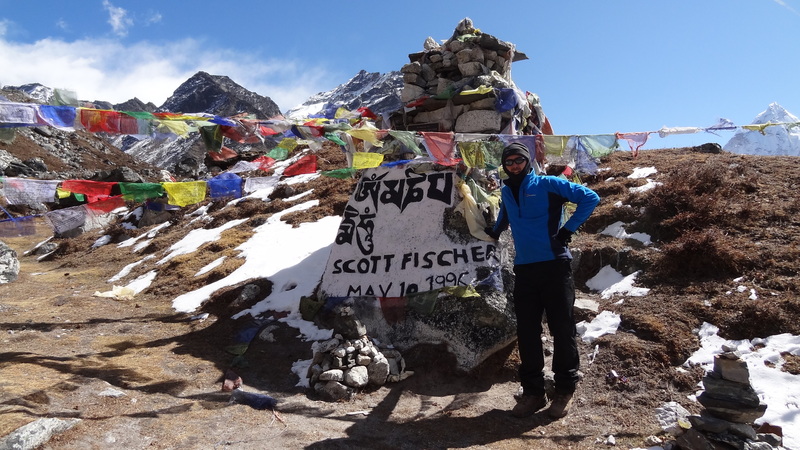 The part where the expeditions go from in April/May time is further along slightly, so to be away from the trekkers and tourists. 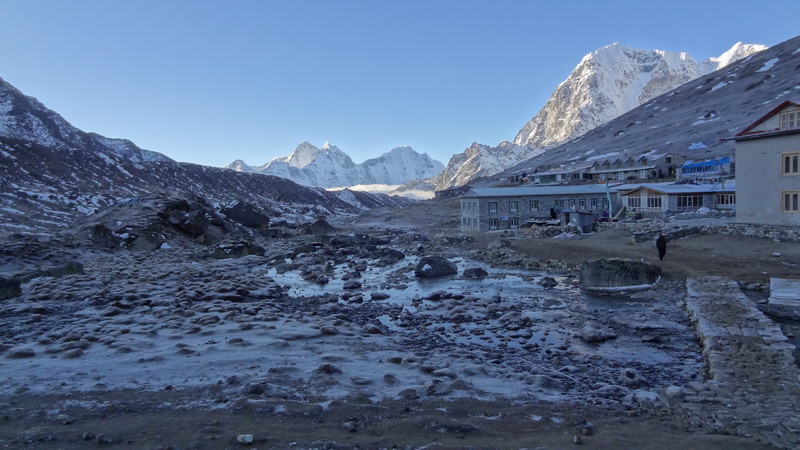 You are still in the same vicinity though – actually staring at the totally incredible Khumbu Icefall, a massively stacked section of seracs, some taller than houses, which starts up between the South Col of Everest and the Lhotse face at about 7,600m. 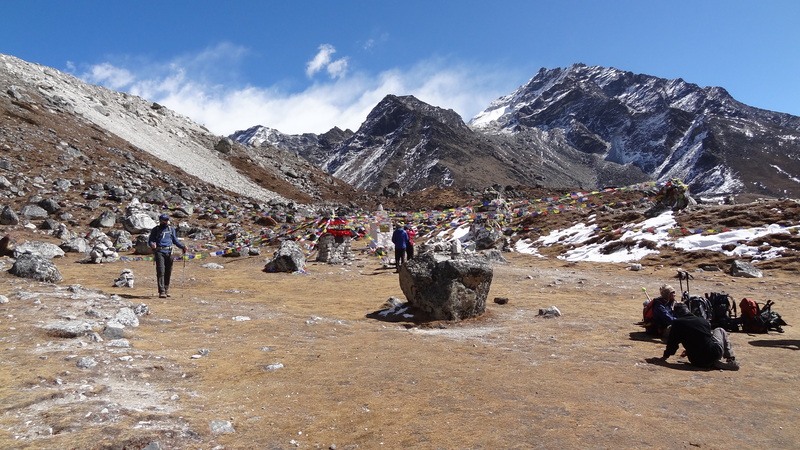 From here you forget about the altitude altogether, as adrenaline just takes over – there is no way you aren’t going to make it to Base Camp, and everyone does. 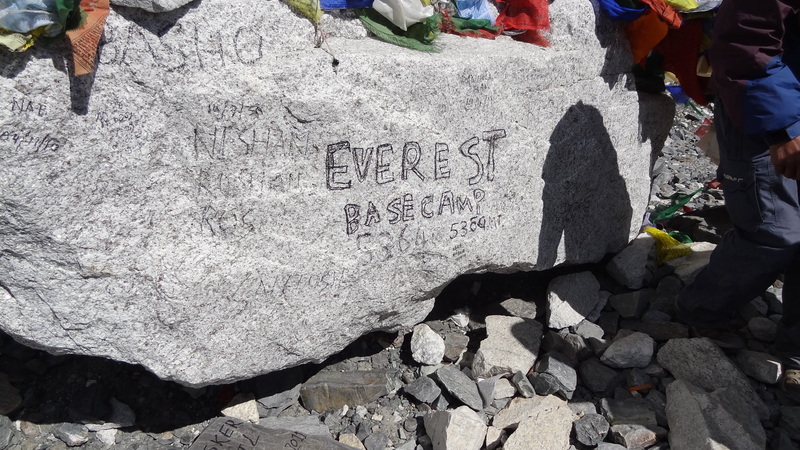 And so finally at about 12.30 Nepal time, we arrived at the inscribed stone on top of the glacier which officially denotes Base Camp at 5,360m. 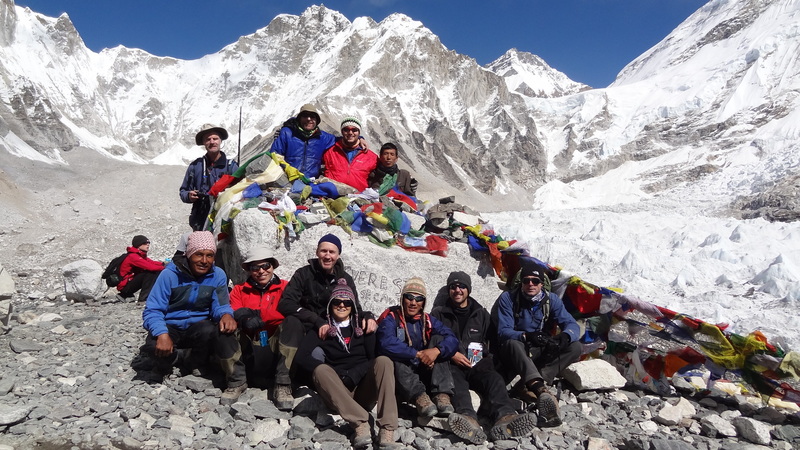 The whole group, including our guides, at EBC. 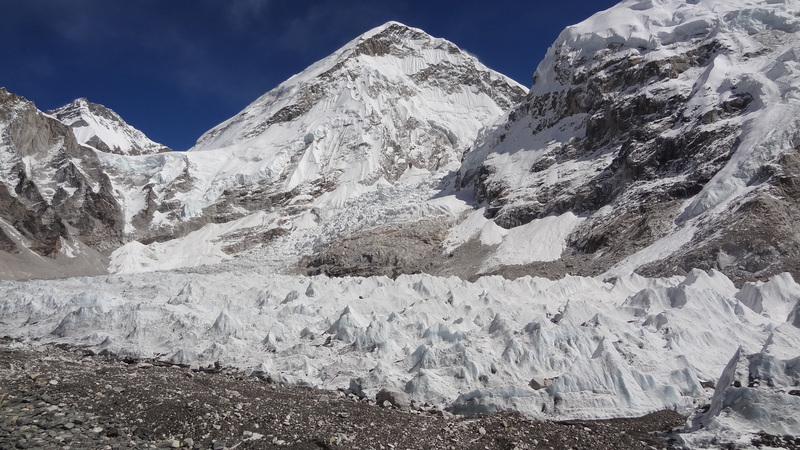 The Khumbu Icefall as seen from Everest Base Camp. What is Base Camp like? Well before I went on this trip, I had it variously described to me as ‘dirty’, ‘boring’, ‘just nothingness’, ‘a pile of rubble and rocks’, and ‘you don’t see anything at all from there’. Anyone who makes those remarks must have had the worst altitude sickness in the world, or just hasn’t been there. Look at the photographs and see for yourself. And what do people expect after all, a gift shop or something? We are at almost 18,000 feet up in the Himalayas for pity’s sake! It is only a figurative, or commemorative place of course, but that is irrelevant. 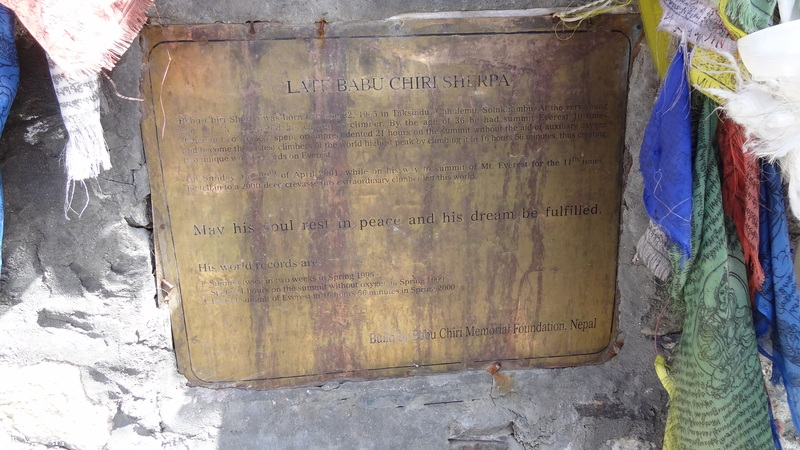 This is the place from which Sir Edmund Hillary and Sherpa Tenzing first ascended the world’s highest mountain. 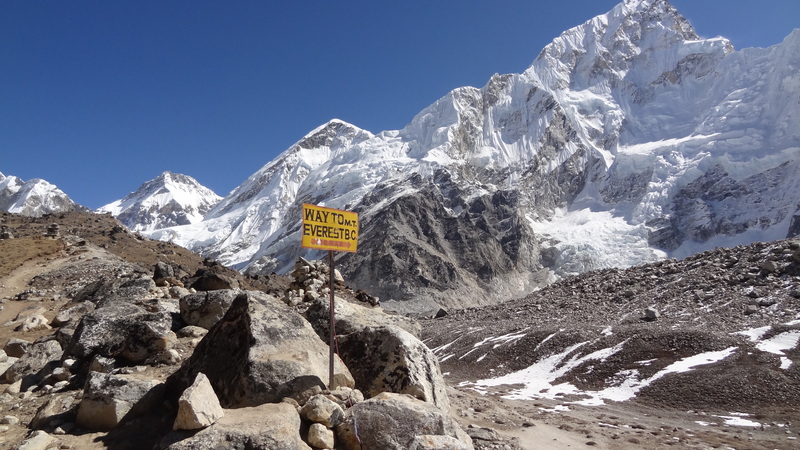 It is from where all the great Everest treks have commenced. You feel it almost. 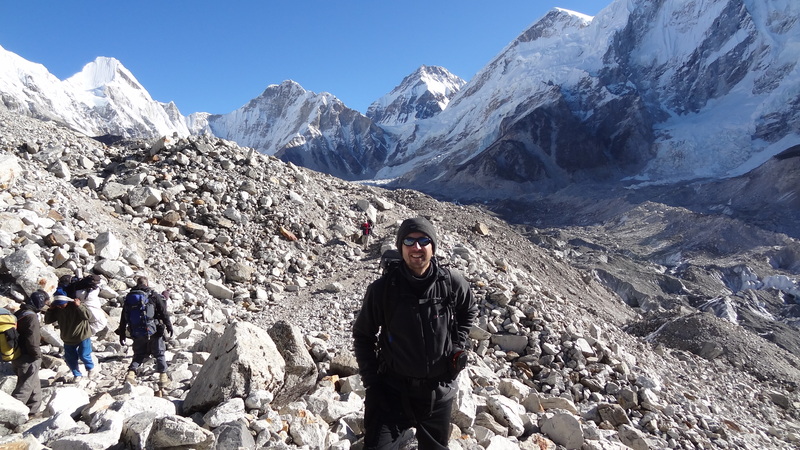 You see the start of the climb in the Khumbu Icefall, you see so much of everything that the Himalayas has to offer, and that is simply more than any other mountain range in the world. Consider this too: The world’s highest mountain outside of Asia, is Aconcagua in The Andes, at 6,962m, or 22,840ft. The Himalayas has over 100 mountains exceeding 7,200m, or 23,600 ft. You get to stand in the heart of it all, the place of giants. You get to say that you have been here too, and I am so happy (ecstatic in fact) to have that particular T shirt. So after about half an hour or so, we turned and headed back towards Gorak Shep. The walk back was long and hard, which although was overall a descent of 200m or so, has many ups and downs, and after about 8 or 9 hours of walking above 5,000m, every part of your body feels it. I was absolutely drained, emotionally and physically when I got back, and don’t think I could have walked another step. My head pounded with the altitude, and after a couple of Paracetamol went and found my room and was asleep within about 30 seconds. It was just a short nap however, as I was conscious of not wanting to sleep for long and then not sleep tonight. Tomorrow we again get up at 5am, to get to the highest point of our trip so far. 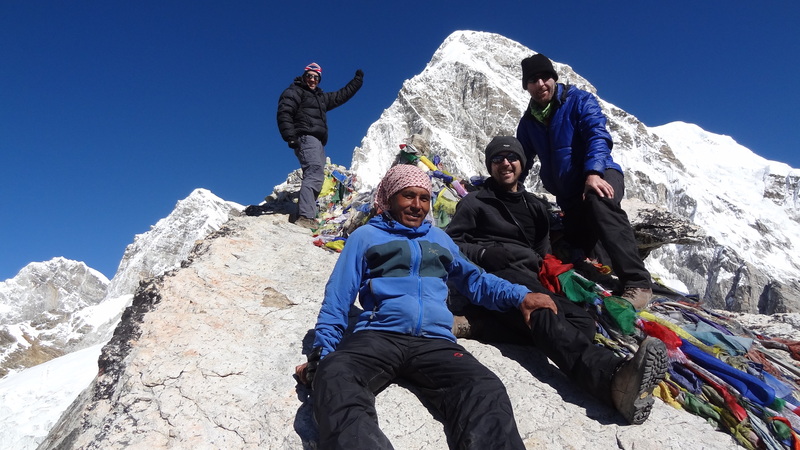 We also get to do a true summit, Kala Pattar, at about 5,650m, or 18,500 feet, which is about 1,000 feet above Base Camp. 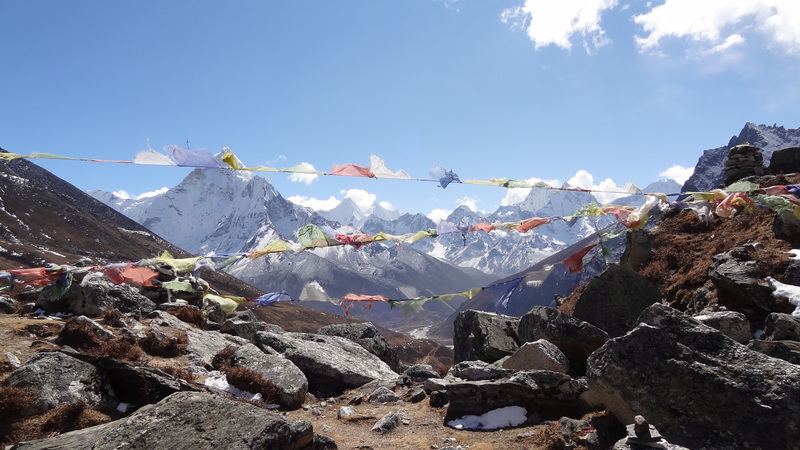 This is about the only place where Everest can be truly seen in most of her glory. 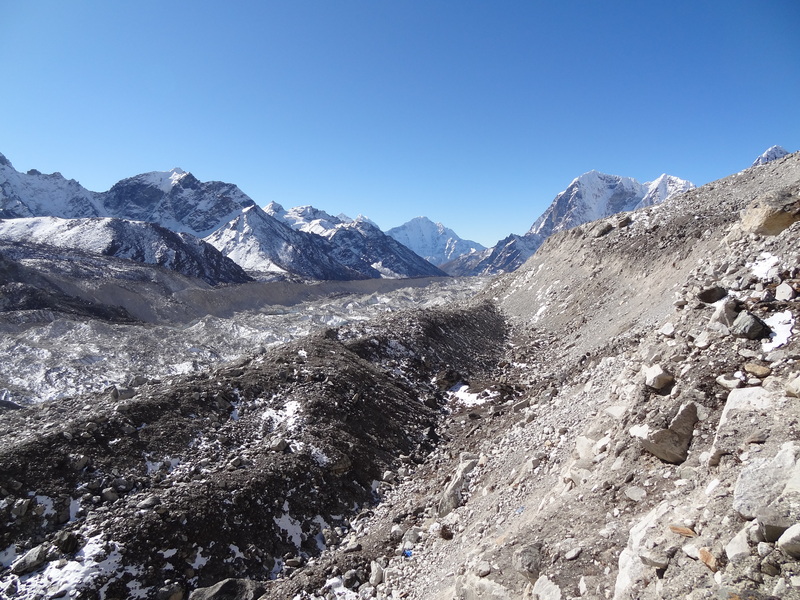 If you have seen a picture of Everest before it was probably taken from the summit of Kala Pattar. 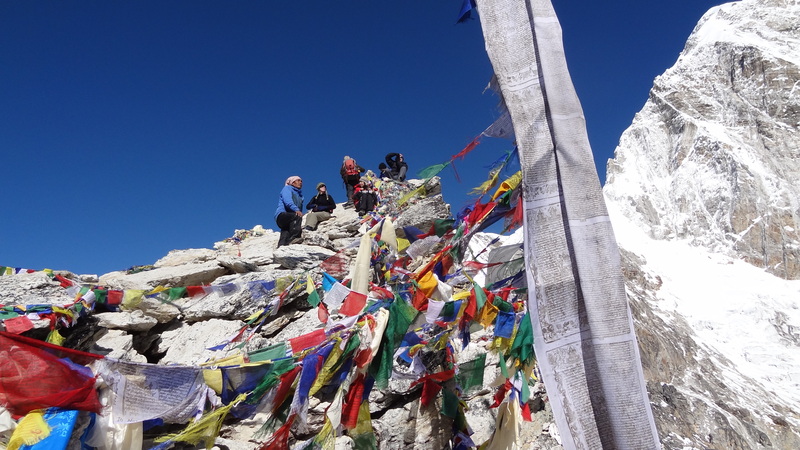 At that sort of height, it is no mean feat of a mountain in her own right, and although not a challenging or technical climb, everything at this altitude is just bloody hard work, make no bones about it. If I make it, I suspect that this will be the highest that my body lets me go on this trip, as I just feel drained with lack of sleep. I’ll be giving it my best shot.